Yale Cabaret alums Becca Wolff and Jacob Padron nurture a Tilted Field in L.A. Late-night runs. Openly experimental rehearsal periods. Testing their limits and working outside the disciplines where they’re most comfortable. Piling projects upon projects. That’s how Becca Wolff and Jacob Padron behaved when they were running the Yale Cabaret a few seasons ago as students at the Yale School of Drama. And that’s how they still operate. Despite working in different cities—Padron is the Associate Producer of the famed Steppenwolf company in Chicago (where he is in charge of the company’s Garage space) and Wolff is the Artistic Director of the IAMA Theatre Company in Los Angeles, where she also works with the Rubicon Group—the erstwhile classmates have formed a new theater company, Tilted Field, involving a number of other recent Yale alums. Tilted Field Productions has a workshop up in L.A. right now, three other shows is development, and countless others in the works. That was the unofficial start of what is now Tilted Field Productions. “It was a slow burn,” the story continues. Padron graduated from Yale in 2007, Wolff a year later. He went off to work for three years at the Oregon Shakespeare Festival, while she finished school (her senior thesis was a production of Friedrich Schiller’s The Robbers), did some shows in New York, then headed back to her California homeland. Tilted Field now has four projects in active development, in several different cities. 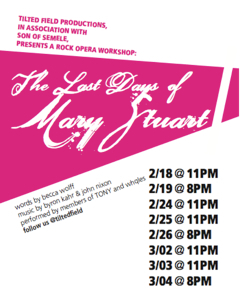 Furthest along is The Last Days of Mary Stuart. A workshop production of the “Romantic epic” royal rock opera began in mid-February at the Son of Semele space on Beverly Blvd. in L.A. The three-weekend workshop has three final performances this weekend: Friday and Saturday at 11 p.m. and Sunday at 8 p.m. The script is original, with dialogue and lyrics by Wolff and music by Byron Kahr and John Nixon, whose band TONY plays live alongside the three-person cast of Charlotta Mohlin (as Mary), Meagan Prahl (Elizabeth) and Alex Knox, the Yale alum who created the mime-like show EYE, as Paulet. But The Last Days of Mary Stuart was inspired by a play by the same controversial 18th century playwright/philosopher/provocateur who’d penned The Robbers, Friedrich Schiller. “There’s something Jacobean-tragedy about it,” Wolff says of the Schiller play. “The arguments are very beautifully worded. Great onstage conflicts. Grand foundations on which to build a new work. “The band did the score,” Wolff says, “I would bring in the lyrics, and they would tailor them to be more of a rock song. We originally tried to set a scene from the Schiller play, but it was not fun to sing. So we took the central theme from the scene and built a chorus around it. It’s down to ‘inspired by’ about the Schiller. It’s gone pretty far from that text at this point. One of Wolff’s key projects at the Yale Cabaret also happened to be a musical—Bicycling for Ladies, a historical piece set in New Haven which examined some freedom and dangers which grew out of turn-of-the-century urban industrialization. The show, which featured a radical female Elm City bicyclist, was also given a staged reading atop New Haven’s East Rock during a city biking festival. Wolff’s collaborator on Bicycling for Ladies, playwright Dorothy Fortenberry, is providing dramaturgical help on Tilted Field projects. Another Yale School of Drama grad, Michael Locher, designed the set for Mary Stuart. Other Tilted Field projects currently in development include a modern California-based adaptation of Chekhov’s The Cherry Orchard, titled Species Native to California; The Orange Project, set designer Locher’s “visual adaptation of a novel by a celebrated Mexican author”; and Baby Loves Robot by Terea Avia Lim, who graduated in 2009 from the Yale School of Drama acting program (having blown a few minds as The Caretaker’s Wife in Ghost Sonata, Wang in Man = Man and Agave in The Bacchae). Considering that they’re modeling their company on one of the longest-running, versatile and consistently experimental small theaters in America, the Yale Cabaret, that commitment’s worthwhile. One Response to Yale Cabaret alums Becca Wolff and Jacob Padron nurture a Tilted Field in L.A.
Great article, and thanks for the shout out, Chris. Hope all is well in New Haven!